A great post today over at The Fleer Sticker Project on fans sitting on the billboard in center field during the 1967 World Series. Hard to believe one could pull of such a feat. Also hard to believe that the Red Sox are at home for Game 6, one win away from their third World Series title in ten years. I remember back in April thinking the Sox would be lucky to get to .500. I never would have thought they’d have a shot to make the playoffs, never mind the World Series. 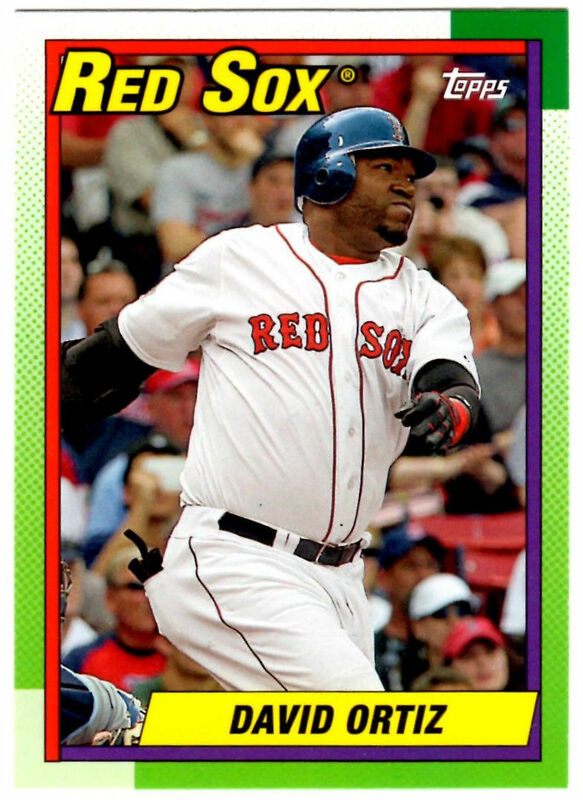 In honor of tonight’s game, here’s David Ortiz’s card from this year’s Topps Archives set. It obviously is based on the 1990 design. I’ve always had an interesting relationship with 1990 Topps. I hated it, even when I was eight-years old when it was released. I thought the radical! neon color scheme was lame and an eyesore back then. Still, I bought a crap-load of the stuff; I must have hand collated the set two or three times over. Great shot of Ortiz here, looking as locked-in and cool under pressure as ever. Hopefully he knocks a couple out of Fenway tonight and the Red Sox are able to wrap things up!